So let's start by viewing the data we have. Protists such as paramecium engulf solid food (such as yeast cells), forming food vacuoles, within which the food is digested. This process can be followed using a simple light microscope, allowing us to see both where in the Paramecium the vacoule is at any given time, as well as its size. In addition, staining the Parameciums food (yeast cells) with a pH-sensitive dye (Congo red) allows us to monitor the pH inside the food vacuole. The figure to the right illustrates this process. The food vacuole moves around the cell over time. 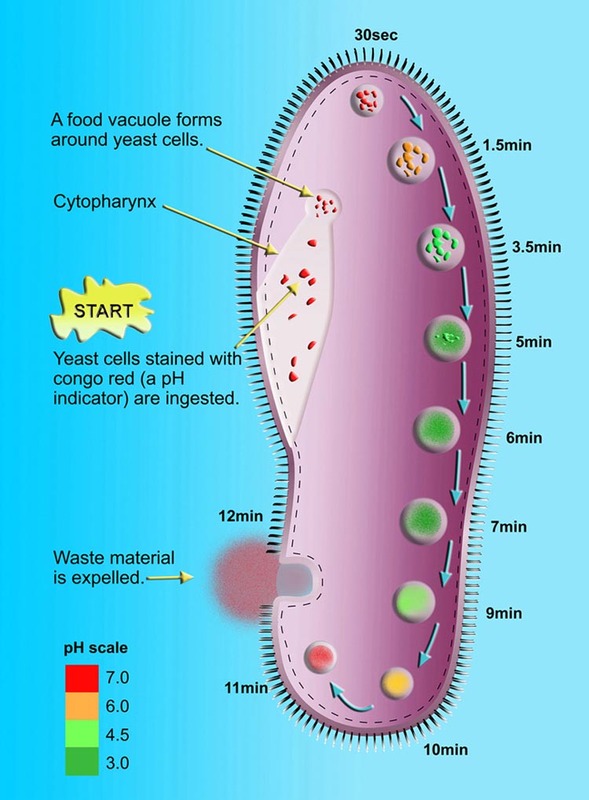 The yeast cells within the food vacuole are degraded . The pH within the food vacuole changes constantly (as is evident by the Congo red dye changes within the vacuole).